You're invited! 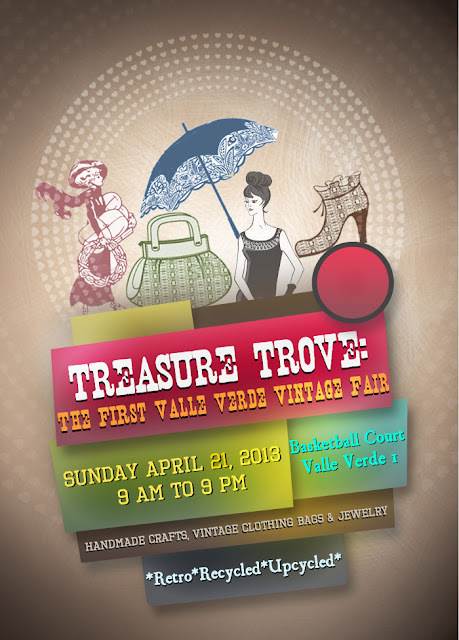 This one-of-a-kind event offers a unique opportunity to sellers of retro items such as handmade crafts with a vintage flair, pre-loved designer/high-fashion clothing, bags and jewelry, recycled and upcycled products, book swappers/sellers, antique dealers. There will be over 30 food and non-food concessionaires joining the event. The event coincides with the first village fest / town hall of Valle Verde I. Catholic mass is usually held in the area on Sundays. Other activities include Art in the Park during the day, and live music concert in the evening to cap off a day full of fun and activities. Admission is free. However, since this is in a gated subdivision, non-residents would need to show their identification at the gate for security purposes.